IS THIS A REAL FARM? Yes this is a real working farm. So expect a little dirt, and no high heel shoes or sandals, please. Surrounded by fields or corn….gather with friends and family near the warmth of our bonfires. A perfect place to celebrate the Halloween season. DO YOU HAVE SPECIAL ARRANGEMENTS FOR GROUPS? Scout groups, schools, sports teams and clubs can get special rates. Or just get a group of your friends or work associates together. The more people the more fun! Groups get preferential treatment. Call 215-860-6855 for more information or to make arrangements. HOW CAN I AVOID SPENDING TIME WAITING IN LINES? There are several ways to avoid lines. Visit us during the first two weekends in October or on Sunday or Thursday. (Check dates for 2017) These days tend to be less crowded. You may purchase tickets online which allows you to use our quick scan window to enter the farm. Also RIP tickets are available which allow you to go to the front of the general admission line for any attraction. MAY WE BRING OUR OWN REFRESHMENTS? Yes, you may bring your own snacks. For your convenience we have a variety of refreshments available. We even have kits for you to make your own s’mores at our bonfires. Remember: NO ALCOHOL. WHAT FORMS OF PAYMENT DO YOU ACCEPT? We accept Visa, MasterCard, Discover and American Express. We only accept checks when special arrangements are made in advance. DO YOU HAVE ANY SPECIAL DEALS? On selected nights you and your friends can experience all 3 attractions for the price of 2. Buy a combo 2 ticket for $26.00 and get the third attraction FREE! Save $20 off individual attraction prices. Offer good Sept. 30, Oct. 8, 26 and 29. Not good with any other discount. HOW CAN I WORK AT SLEEPY HOLLOW? There are many of us who have been getting together for years to work at Sleepy Hollow. It is like an extended family. We also welcome new help. 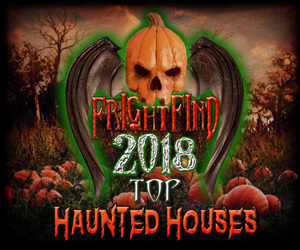 To work with us at the haunted house contact us at: info@midnightpro.com.